Everyday this week…Brett Rounsaville brings us the Weirdest Disasters ever to strike down man or beast. In 1986 in Bangladesh death quite literally rained from above (…well, no…I guess that is figurative too since it was actually death, it was hailstones, and it didn’t actually rain so much as, y’know…hail). 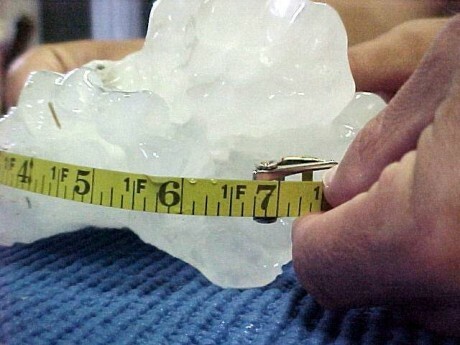 Bottomline: These Bangladeshian iceballs measured almost seven inches across and weighed in at 2.2 pounds. They fell with such force that the storm killed 92 people and leveled entire homes. That’s like being shot in the face with an iPad duct taped to a loaf of bread moving at over 100 miles per hour and being hit with the significantly less squishy iPad side so that the loaf of bread doesn’t add any padding, just weight. Better? This is not the kind of hail where you put on a bike helmet and run around outside like an idiot taunting nature as it bounces off your Styrofoam and fiberglass covered noggin. This is the kind of hail where you hope to Science (this blog has a bit of a skeptic bent in case you haven’t noticed) that you’re near a bomb shelter and/or a giant hairdryer pointed at the sky. Even larger hail fell in Nebraska in 2003…but apparently Nebraskans are better at staying indoors than Bangladeshians (probably because there’s nothing to do outside there anyway if you’re not growing corn…). 4. World’s Most Homicidal Lake! What do you think, gang? Sound off! You are currently browsing the archives for the Weird Off category.